Gumecindo Hernandez was called home to be with our Lord and Savior June 5, 2018. 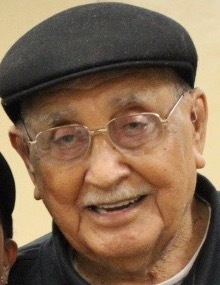 He was born January 13, 1927 in Taft, TX to the late Alfonsa and Petra Saldana Hernandez. Those left to cherish his memory are his loving wife of sixty seven years Guadalupe M. Hernandez, children; Ramon Hernandez, Daniel Hernandez and wife Yolanda, Patricia Hernandez, Diane Rangel and husband Sam, Teresa Hernandez, Ernestine Hernandez, Irene Flores and husband Greg, Elvira Levine and Alejandro Hernandez and wife Cindy, Siblings; Luisa Deandra, Lupe Narvarez, Ernesto Hernandez, Andrea Arellano, Joe Hernandez, and Teresa Guerrero Hernandez, twenty six grandchildren, forty seven great grandchildren, and three great great grandchildren. He was preceded in death by his beloved sons Gumecindo Hernandez Jr. and Maximo Hernandez, his precious grandson John Jacob Guzman, and loving brother and sisters Pedro Hernandez, Felicita Aleman, Nieves Cortez and Julian Hernandez. Gumecindo proudly served as a Private First Class in the United States Army and was an AAF Gun Crewman. He enjoyed his music; playing the guitar and accordion, watching western movies and cheering on his teams in college football and baseball. He loved family gatherings especially when it came to giving him gifts. Gumecindo was loved so much and will be missed dearly by all that knew him. Visitation will be today 9am to 8pm with a rosary beginning at 6:30pm at Chapel of Grace Funeral Home. A mass of Christian burial will be celebrated 1pm June 8, 2018 at St. Joseph Catholic Church with interment following at Peaceful Gardens Memorial Park.